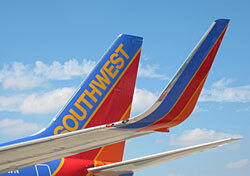 Join Southwest’s Loyalty Program … Please!!! How badly does Southwest want you to join its Rapid Rewards frequent flyer program? So badly that it’s offering new members eight credits: six to sign up, plus two more for opting in to receive promotional emails. That’s half the number of credits required for a free ticket. As sign-up bonuses go, this is one of the most generous you’ll ever see. There is a catch: You must live in Massachusetts or New York. As always with such stipulations, “live” means having a Massachusetts or New York mailing address in your Rapid Rewards membership profile. Since the offer only applies to new accounts, it would be an easy enough matter to register with a mailing address in one of those two states, no matter where you actually reside. I’m not suggesting you do that—I’m just pointing out the possibility, which Southwest must be aware of as well. Why the geographic targeting? Southwest launched flights to New York’s LaGuardia airport earlier this summer and flights to Boston earlier this month. And more generally, Southwest has been gradually expanding its focus to include business travelers, who are especially engaged with airline loyalty programs. So this initiative is clearly designed to boost Southwest’s presence among the business travel community in those two markets.